. 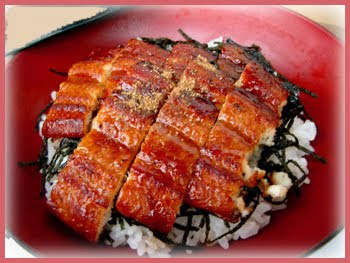 unagi, 鰻 / うなぎ, eel, Aal - Anguilla japonica . the day of doyoo 土用 Doyo in summer, to gain strength in the great heat.
. anago 穴子 / アナゴ / 海鰻 conger eel - Congridae family.
. hamo 鱧 pike conger eel - Muraenesox cinereus . 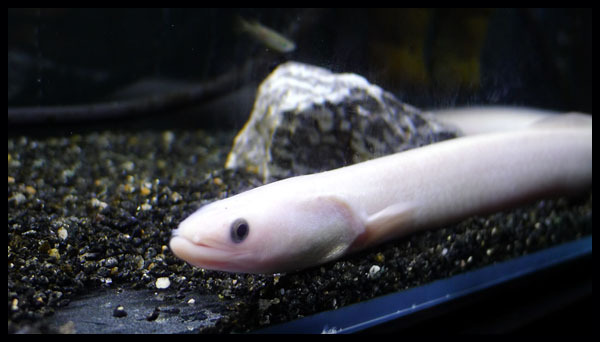 One of the nana fushigi 七不思議 seven wonders of Namie is a 白ウナギ　/ 白鰻驪 white eel. 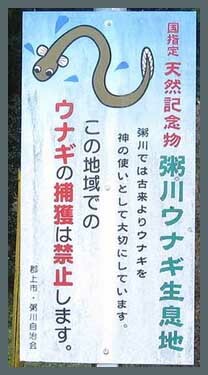 Why the people of this area do not eat eel in Summer. 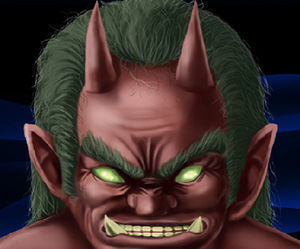 at mount 瓢ヶ岳 Fukubegatake (1,162m) there lived an oni 鬼 demon. Sometimes he came down the river 粥川 Kayugawa and caused great distress to the people living there, sometimes killing and eating them. On orders of the Emperor the brave 藤原高光 Fujiwara no Takamitsu (c. 939 - 994) came here to drive out the Oni. But the Oni used his ability to become invisible and could not be found easily. 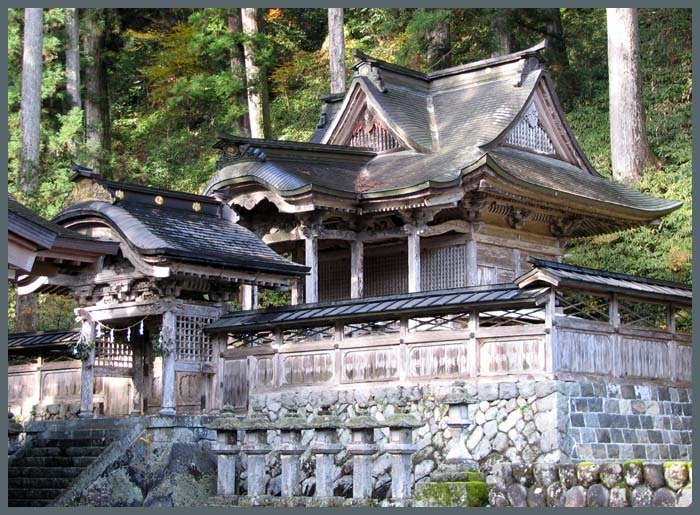 Takamitsu built four small shrines on mount Fukubegatake and 高賀山 mount Kogasan and prayed for help to 空蔵菩薩 Kokuzo Bosatsu. The deity granted him an arrow with pure white feathers. 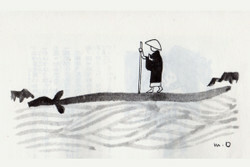 Then 白鰻 one white eel appeared in the river and moved around as if he wanted to show the way to Takemitsu. Takamitsu followed the eel and found the Oni. With his strong bow and arrow he killed him with one shot. 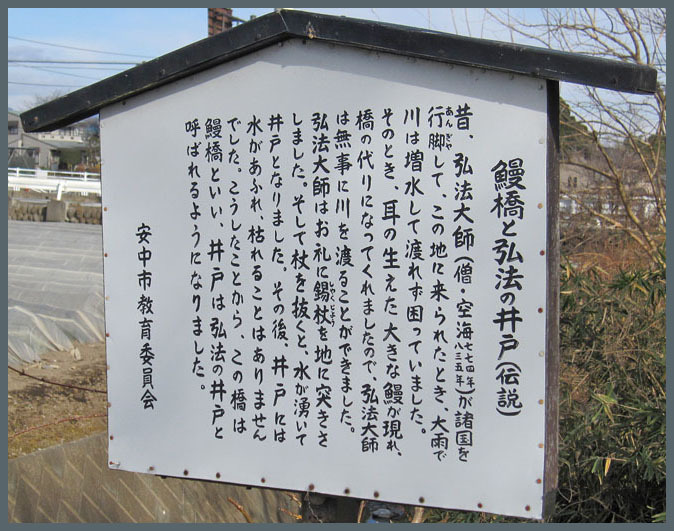 矢納ヶ淵 Yatogafuchi "the riverpool where the arrow was offered to the Gods". From this time on, the villagers living along the river saw the eel as a messenger of the Deity and never ate a bite of eel. Now there live a lot of eel happily in this "eel paradise". They are protected as a 国の天然記念物 natural monument. Another version of the legend tells of Takamitsu cutting off the head of the Oni and when he washed his bloody sword in the river Kayugawa, it turned into an eel. 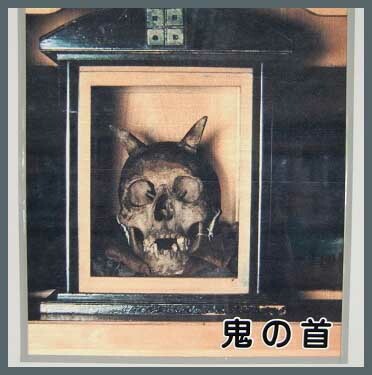 The head of the Oni was taken to the temple Nenkooji 念興寺 Nenko-Ji by the villager 粥川太郎右衛門 Kayugawa Taroemon. waka poet and Japanese nobleman. At 東横野字上間仁田 Higashiyokono Kamimanita is a bridge called 鰻橋 Unagibashi, where fishing is not done. to walk over and thus help him cross the river. and made a well which never got dry. 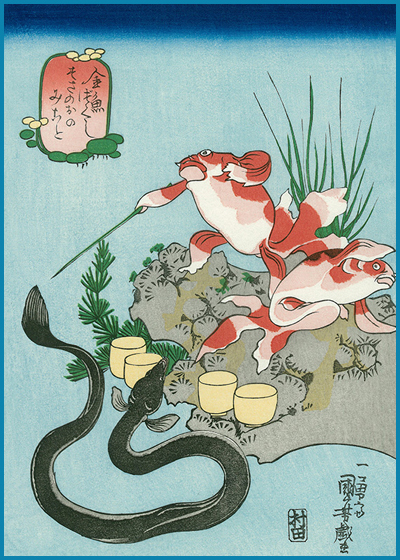 When Kobo Daishi tried to drink water from the river, a lot of eels were swimming around and made the water dirty. So he banned the eels from living in this spot, to teach them a lesson not to disturb thirsty travelers. is venerated on a rock with a shimenawa 注連縄 sacred rope around it. There live 黒鰻 black eels and 白鰻 white eels. If people saw a black eel, it would rain. If they saw a white eel, it would shine.. Many people came to find out about the rain in their region. 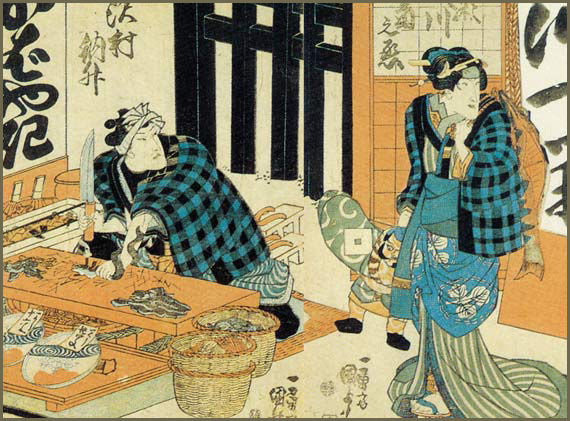 an old farmer wanted to prepare an eel for the Doyo no Hi in summer, but the eel escaped. The farmer ran after him, but the eel escaped and climbed up to 天道 Mount Tendo. Up there was a great house where 大鬼 a huge demon lived. When the wife of the demon used her flint stone to make fire, there was lightning in the sky. When the demon hit his drum, there was a great rumbling in the sky. The Oni gave the farmer a small pot with water. When he spilled just a little of water, there would be 夕立 an evening shower.
. oo unagi 大鰻 the big eel causing earthquakes .
. Norota eel ノロタ（海鰻 umi-unagi) and Tsunami . Muraenesox cinereus, also called anago アナゴ. In the middle of the river 興津川 Okitsugawa was a huge meotoiwa 夫婦岩 "Rock for a Married Couple". If water accumulated in one of the holes, this was a sign of bad fortune. People said a red eel lived there. The owner of an eel restaurant in 麻布 Azabu suddenly became crazy and lay himself on the board for cutting the fish. He stuck the knife into his mouth and cut himself open to the stomach . . . then he died, obviously thinking he was an eel. This was his divine punishment for cutting life animals all his life. a young girl and a young man were travellilng together. But one night the young man disappeared. The young woman got crazy with worry and walked around looking for him. Eventually she threw herself in the pool of a waterfall and died. From that time on in the waterfall pool there lived a female and a male white eel. People thought the young woman must have been pregnant and given birth to a male baby boy. In the spooky hours of the night, sometimes a green-blue flame can be seen hovering over the water and the voice of a crying baby is heard.